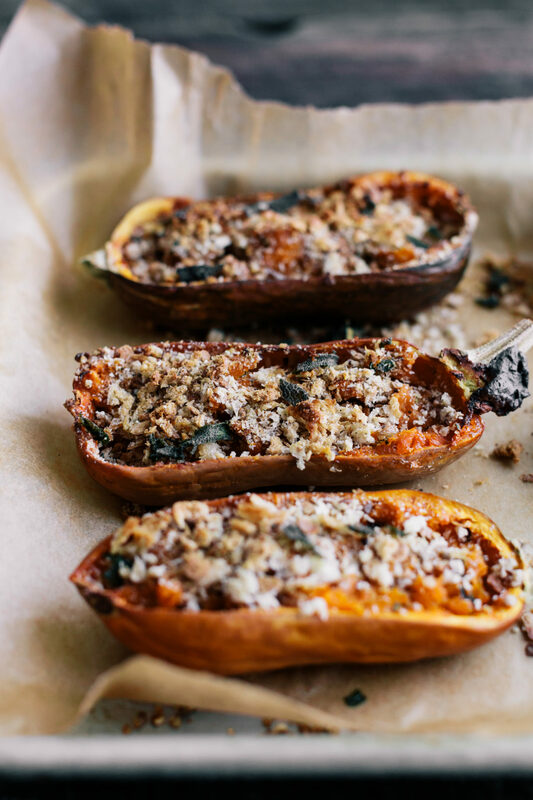 Twice-Baked Honeynut Squash with Brown Butter | Naturally. I’m sliding into the holidays with a solid side dish idea, sure to start a conversation. These twice-baked honeynut squash are not only delicious but have a fun story about this newer squash variety. Honeynut squash was developed through a challenge between Dan Barber and Michael Mouzarek. 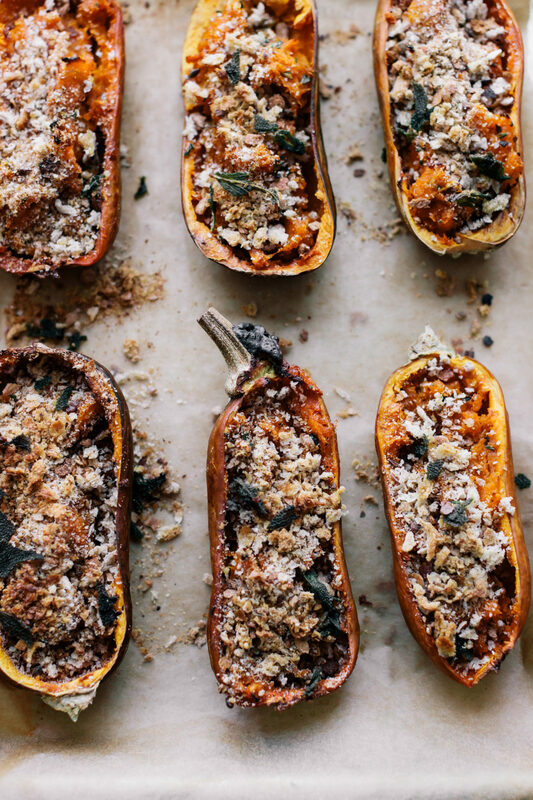 The goal: grow a better version of the butternut squash. Amazingly enough, not only did the honeynut squash come from that challenge but a new seed company focused on cross breeding vegetables (called Row 7). I have dreams of growing quite a few different varieties. In terms of the honeynut squash, think of what a butternut squash taste like but intensify the flavor. It has a warm sweetness that the traditional butternut squash just can’t rival. The honeynut squash was bred with taste in mind, and it definitely lives up to that goal. Of course, it’s not always easy to find these delightful squash and that’s okay. 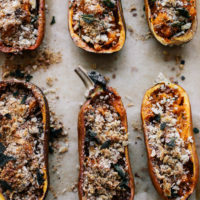 This recipe would work just as well with regular butternut squash, delicata squash, or acorn squash. You could always switch mediums and try a twice-baked sweet potatoes. Obviously, this would make a great addition to your holiday meal. It’s the perfect way to add color to your meal. Plus, these twice-baked honeynut squash can easily be prepped ahead of time and baked the second time right before serving. Beyond the holidays, this recipe is great as a side with a solid salad (like this recipe), quinoa or brown rice cakes, or with a quiche/egg bake. Swap the butter out for olive oil. The flavor won’t quite be the same but it will work just as well. You could also go with a flavored oil like walnut oil. Using walnut oil would add a nice added flavor of the walnuts, working well with the rosemary and sage. A stunning side dish ready for the holidays or Sunday dinner, these twice-baked honeynut squash are light on ingredients but not on flavor. Heat your oven to 425˚F. Slice the butternut squash in half, lengthwise, and place cut-side down on a sheet tray covered with parchment paper. Bake until the squash is tender, 25 to 40 minutes, depending on the size of your squash. Remove from the oven, remove the seeds, and scoop the remaining squash into a bowl. While the squash bake, place butter in a warm skillet. Let the butter melt and continue stirring while butter foams up. Once brown flecks appear at the bottom of the pan, remove from the heat and stir in the rosemary and sage. Let rest for a few minutes then stir into the bowl of squash. Add the salt and stir to combine everything. Transfer the butternut squash filling back into the squash shells. Sprinkle with the breadcrumbs and return the pan to the oven. Bake for 10 to 12 minutes, just enough to brown the tops. Remove from oven and sprinkle with crushed fried sage. Tips & Tricks: To fry the sage, heat a small amount of oil in a pan. Add the sage and cook until the sage changes color, flipping once. Remove from the skillet and let cool/crisp. Hi! Did you grow these squash or find them locally? Locally at the Sunday farmers market!